Former New York City Mayor Rudy Giuliani is joining the legal team defending President Donald Trump in the special counsel's Russia investigation. 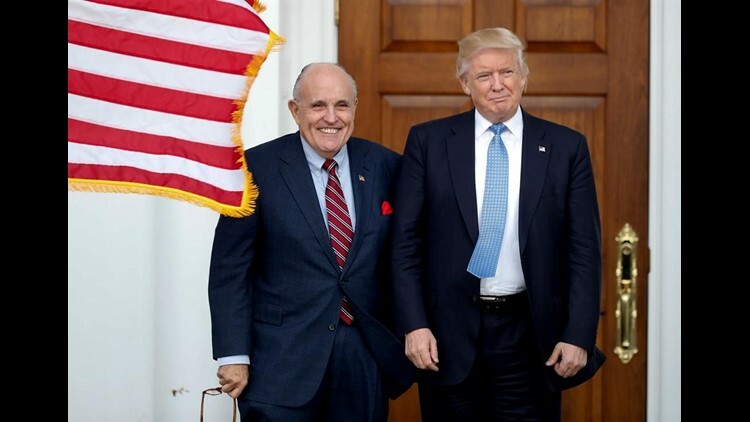 WASHINGTON (AP) — Former New York City Mayor Rudy Giuliani is joining the legal team defending President Donald Trump in the special counsel's Russia investigation, a Trump attorney said Thursday. With the addition of Giuliani, Trump gains an experienced litigator and former U.S. attorney in Manhattan. Trump is looking to bring his involvement with special counsel Robert Mueller's investigation to a close, and is considering whether to sit for questioning by Mueller's team. Giuliani also fills the void left by attorney John Dowd, who resigned from the legal team last month. Trump personal attorney Jay Sekulow told The Associated Press that Giuliani will be focusing on the Mueller investigation — not the legal matters raised by the ongoing investigation into Trump attorney Michael Cohen. That probe is being led by the U.S. attorney in Manhattan. Cohen's office, home and hotel room were raided last week by the FBI, provoking a backlash from Trump in which he publicly weighed whether to fire Mueller or Deputy Attorney General Rod Rosenstein. He also intensified his public attacks on the Mueller investigation, calling it "an attack on our country." Trump's legal team has been told by Mueller that the president is a subject of the investigation, not a target, though that designation can change at any time. In a statement announcing Giuliani's hire, Trump expressed his wish that the investigation wrap up soon. In addition to Giuliani, two other former federal prosecutors — Jane Serene Raskin and Marty Raskin — will be joining Trump's legal team.